« The end of summer already? Hanna, Ike and Josephine are up to bat. Click the image for a larger version. Hot on the heels of Hurricane Gustav, an alphabet of storms is lining up to threaten the United States coast. Tropical Storm Hanna is the closest and can’t quite make up her mind what she wants to do. The storm was a hurricane for a time but has been downgraded as its winds have dropped to 70mph. Hanna has been battering the Bahamas with torrential rain and in Haiti it has claimed 61 lives, mostly from flooding. After meandering around, it is now heading northwest at 12mph and will threaten the southeast coast of the U.S. Friday. Her path is unpredictable but best guesses show the greatest threat of a direct hit from Hanna lies along the Carolina coast between Myrtle Beach, S.C., and Wilmington, N.C. Late Friday night / early Saturday morning it is expected to make landfall as a category 2 storm. Hurricane Ike is currently 550 miles northeast of the Leeward Islands and is moving west-northwest at 17mph. This storm looks to hold the greatest danger of the three right now as it has grown from a tropical storm to a category 4 hurricane with 145mph winds in less than 24 hours. It is too early to determine where a potential landfall might occur but by Sunday morning is should be near Haiti and the Dominican Republic. Folks really need to be on the lookout as this storm could be catastrophic. 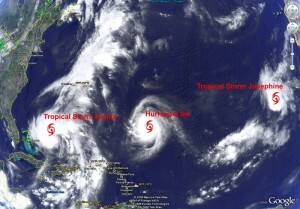 Moving out further from the coast is Tropical Storm Josephine. The storm is currently closer to Africa than the U.S. – about 465 miles west of the southernmost Cape Verde Islands. Sustained winds are at 60mph and the storm is moving west-northwest at 10mph. The current hope is that the storm takes a turn to the north as it crosses the Atlantic and doesn’t hit land. This entry was posted on Thursday, September 4th, 2008 at 9:25am MDT and is filed under National Weather. You can follow any responses to this entry through the RSS 2.0 feed. You can skip to the end and leave a response. Pinging is currently not allowed.